Epsilon Marketing is a U.S.-based marketing services company that uses engagement and direct response marketing to lead its clients’ customers through the purchase funnel. 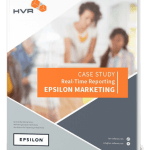 Epsilon’s goal is to help its clients deliver the right message at the right time to the right prospect. It has succeeded in this approach by analyzing up-to-date and accurate customer data to gain customer intelligence.